If you’ve suddenly lost your job, finances can become tight in a hurry. Your savings may be running low, your benefit checks might be small, and you need a way to supplement your income. Sudden unemployment can be unnerving, even if you’ve prepared for such an event. You are now responsible for coming up with enough money to cover all of your expenses when you had steady income. It can be tempting to quickly drain your savings account, turn to a retirement fund, and fill up your credit card. However, it’s important to understand that making certain choices while under unemployment may come with unexpected consequences. For example, any finances charged to your credit card will come back as debt later. This means, even after you find a job, you might still be in a tight financial spot until you can pay that off. However, your credit card may be able to help you from time to time. You just need to know when the right time is to use it. When you lose a job, your financial situation immediately goes from comfortable to a state of emergency. As a result, you’re forced to look at your finances in an entirely different light. Instead of a regular budget, you’ll need to work on an unemployment budget. First, I suggest sitting down and writing out all of your current sources of income. If you’ve just recently lost your job, you might not be getting unemployment benefits just yet. Once you do (or if you do) get benefits, you can add in that income as well. Include any money that you might get in your last paycheck(s) from your former employer as well as anything in your savings account and if you have any other forms of income or liquid assets. Now that you have that total, in a different column write out your current expenses and compare them to your current monthly income. Your goal here is to sustain yourself until you’re able to accept an offer for employment. To go even further, the best way you can get a very clear image of your expenses is to check your actual bank statements. Don’t rely on your memory to tell you how much you’re spending and on what. There are things you might forget and some charges might not come every month. Do a thorough examination of the last three months of bank statements if you can. Write down all of the recurring charges that you see. Chances are, you’ll have some luxuries included in this list that are costing you more money than you can afford right now. Sadly, it may be necessary to part with these subscriptions for the time being. Again, the goal is to help you live as comfortably as possible on, what many would refer to as, a micro budget. Once you’ve evaluated your charges and made some smart cuts, it’s time take a look at other aspects of your budget. Your list of charges should have included all essentials, that includes bills. Rent, food, and utilities as well as loans like car payments, credit cards, and student loans should all be addressed. Just because you’re unemployed doesn’t mean that your bills should be neglected. Neglected bills can and will be reported on your credit history and can give you a hard time in the future when you’re trying to buy a new car, open a new line of credit, or even purchase a home. Credit cards, that’s what we came here to talk about right? The reason I suggest you take a look at each of these previous aspects of your budget before you dive into credit cards is simple — you’re creating more debt. As I said, car payments, student loans, and other loans are important to pay off while you’re unemployed because your credit can be negatively affected and you’ll be charged interest as well. However, with credit cards you’re not only dealing with your credit score, but also potentially much more interest and debt that could be a heavy burden when it’s no longer unavoidable. With that being said, I say to proceed with extreme caution when using credit cards. Do not add credit cards into your budgeted income. Credit cards should only be used when you have no other choice and/or you feel that it’s an emergency. Well, what is an emergency? I have a bill to pay and I don’t know how I’m going to pay it. Yes, you could use your credit card, but you can also call the company and tell them your situation. In many cases they may be willing to work with you in order to hold off on payments for a little while or at least lower your monthly payments until you’re able to pay more. Of course, not every company will allow this. So, if you cannot negotiate and the expense is a definite necessity, charge it to your credit card. Is There a Chance You Might Max Out Your Credit Card? Okay, so we talked about credit and how neglected payments can reflect negatively on your credit score. Well, you’ll also want to be aware of maxing your credit card out. Another thing that will be reflected on your credit history is the amount of loans you’re currently utilizing. This means if you have a credit card and you’re using all of your credit limit, credit agencies and banks will be able to see that you’re having a hard time paying that credit card off. This means, even if you’re making steady payments, you have very little wiggle room on that credit card and if you’re looking to open up a new line of credit, banks may be hesitant to offer you more credit if your current status looks something like that. This is extra tough when you add in the interest and fee factor. Let’s create a scenario where your credit card is maxed out and you’re making the minimum payment necessary for it to not affect your credit. You pay off twenty dollars, but then you’re slammed with a monthly fee and an interest charge from everything that is left unpaid on your card. So, in the end it looks like you’ve only paid a couple measly dollars, when you really put twenty on the card. It can be extremely frustrating. This is something you’ll need to think about when you’re unemployed. 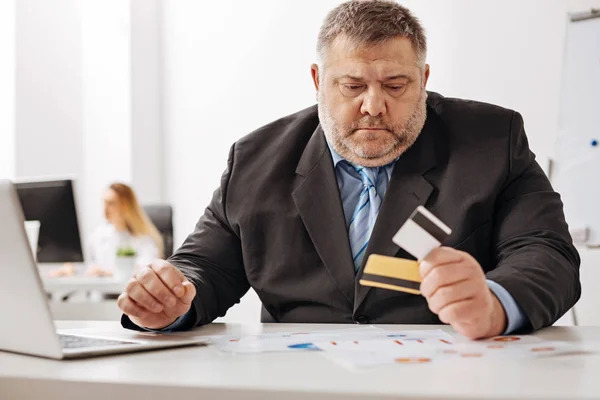 Sometimes maxing out your credit card is imperative just so that you can get by, but you should also know the consequences that you’ll be forced to deal with once you do have a job. Even for someone who’s employed, chipping away at a mountain of credit card debt, fees, and constant interest charges can be draining on the wallet. Is it impossible? Absolutely not, but it can add stress to a new job or your current job search. I’m not telling you to never use your credit card when you have to. It’s simply a better idea to try to use it in increments that you know you can handle. Trying to look for a job, sign up for benefits, and manage your smaller income is hard enough as it is. Everyone can agree that adding a chunk of debt to your situation isn’t making anything better. If you stick to an unemployment budget first and then supplement in your credit card when you really need it, you’ll be just fine. Need more information on how to use a credit card? Visit our credit card learning and resource center. For more tips and guides for improving your credit, visit our credit score learning and resource center. This post was updated February 28, 2019. It was originally published July 19, 2017.